Fight chills with this warm blanket. Swiss chocolate. Swiss banks. Swiss cheese. And now, this Swiss Military Surplus Wool Blanket at a bargain price! Hailed as excellent protection against the cold, it's ideal for chill-chasing warmth at the deer shack, cabin and more. Perfect for cat naps and as an extra layer at bedtime, too. Swiss Military Surplus Wool Blanket, Used is rated 4.0 out of 5 by 3. Rated 3 out of 5 by Sampson76 from Not 100% wool ! I’ve purchased several of these blankets and for the price they are great , but they are reproduction blankets that are 80% after having done some research !!! I’m sure they have suckerd many people saying 100% used , but all four of my purchases I swear are new ! I will not be buying anymore ! Rated 4 out of 5 by Example from Reproduction According to German web site, these W 68 marked blankets are reproductions by Sturm; 80% wool and 20% polyester. 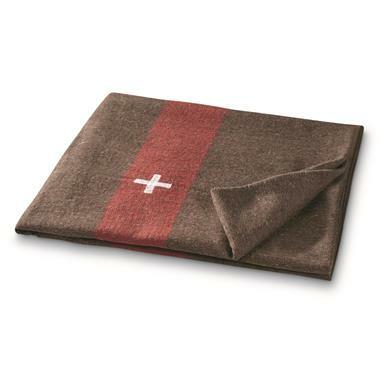 Translated quote "Although many fellow dealers claim that this is an "original" Swiss blanket, it remains a replica!" Rated 5 out of 5 by Eric B from Worth it at twice the price! Hands down the best wool blanket for the money! 100% wool, genuine Swiss military issue, not the fake Indian one. It did have a slight kerosene type smell to it, but an hour in the dryer with no heat and a few dryer sheets got rid of the smell.